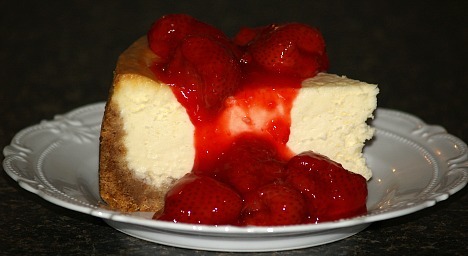 I learned how to make strawberry cheesecake recipes as my first experience with blending of flavors in this dessert. Strawberries and cheesecake; what a combination! The strawberry swirl cheesecake is just as delicious. I cannot believe that there is one soul who does not love strawberries. When I was little my dad had about five acres in strawberries. All my siblings had to go out to pick the berries in the spring. While many of my siblings were complaining about the task I just could not wait. Of course, I was too little to work but not too little to eat the berries. Back then we never used the chemicals to fertilize or for the bugs so we didn’t have to worry too much about eating them right from the plants. Fresh sun warmed strawberries are simply delicious. Little did I know then that I would learn how to make a delicious strawberry cheesecake and it would become one of my favorites! I learned how to make strawberry cheesecake recipes first with a basic plain (but delicious) cheesecake topped with fresh sliced strawberries. When I ate this, I thought how can it get any better. The next time I ate it my sister added a little sugar to the berries and left them set before serving on the cheesecake. Well with the sweetened berries and a little of the strawberry juice, it just got better. People started cooking the berries with sugar and a little cornstarch to thicken. This is really good over plain cheesecake. Today we have many versions of the strawberry cheesecake recipe and some are even easy to make; some with the berries on top and some with the berries in the dessert. I have never tasted any which I did not like. It truly is a great combination! This recipe was given to me years ago. It is one of the strawberry cheesecake recipes coming from Disney. I was told it is from Land Grille Room at Epcot (I am not sure if it is still there). First prepare the cake and then the topping. Cover bottom and sides of 9 inch spring form pan with foil. 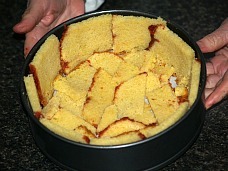 Cut pound cake into thin slices; line bottom of spring form pan piecing to make solid layer. Blend cream cheese until smooth; add sugar and extracts blending until smooth. Beat eggs and yolks together and add slowly to cheese mixture beating until smooth. Blend in cream; pour into cake lined pan. Set pan in a larger pan and fill half way up pan with hot water. Set both pans in oven and bake 35 to 40 minutes until cake is firm. Remove from water bath and cool; chill until cold. In saucepan combine ½ cup water, 1/3 cup sugar, food coloring and salt; bring to a boil. Dissolve cornstarch in 2 teaspoons water and add to mixture; stir and cook 3 minutes and remove from heat. Soften gelatin in 1 tablespoon water; add gelatin and lemon juice to cooked mixture; blend and cool. Wash and dry strawberries, remove caps and stir into cooled cooked mixture; toss and coat all berries. Whip heavy cream with 1 tablespoon sugar until stiff. 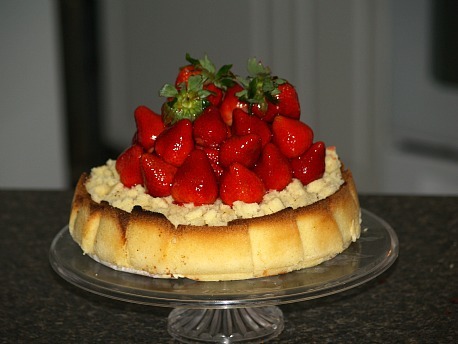 Arrange strawberries on top of pound cake; spoon whipped cream on top around edge before serving. NOTE: An alternative way to serving: Cover top of cold cheesecake with pound cake. Top cake with clean and dry strawberry halves, cut side down. Melt 2 cups of apricot glaze (from gourmet shop) and spoon over berries. Sprinkle graham cracker crumbs around outside of cake and chill before serving. How to make strawberry cheesecake that is frozen. Beat cream cheese, sugar and vanilla in a large bowl until smooth. Fold in the strawberries, Cool Whip and pecans; pour into crusts. Cover and freeze 3 to 4 hours or until firm. Remove from freezer 15 to 20 minutes before serving and top with graham cracker crumbs. Learn how to make strawberry cheesecake with the berries covered in a fruit glaze. For glaze wash 3 cups berries in cold water; remove stems. In medium saucepan crush berries with potato masher. Combine sugar and cornstarch and stir into crushed berries. Stir constantly over low heat until boiling or mixture is thickened and translucent; strain and cool. For filling beat in mixing bowl cream cheese, sugar, orange peel, juice and light cream until light and fluffy. Spread in cold baked pie shell. Wash remaining 3 cups berries, drain, dry and hull. Arrange berries over cream cheese mixture; pour cooled glaze over the berries. Refrigerate about 3 hours or until thoroughly chilled. Learn how to make strawberry cheesecake with strawberry glaze. Grease 9 inch spring form pan with butter; dust with crumbs. TO MAKE FILLING combine cheeses in mixing bowl; beat on high speed until smooth. Gradually add sugar and beat well; add eggs gradually beating while beating well. Add sour cream, butter, cornstarch, lemon juice and vanilla beating on low until smooth. Pour batter into prepared pan; bake 70 minutes. TURN OVEN OFF and let cheesecake in oven for 2 hours without opening the door. Cool on rack to room temperature; cover and chill overnight. Remove sides from pan; arrange whole strawberries on top of cheesecake. Mash strawberries; combine strawberries, sugar and cornstarch in heavy saucepan. Mix well; cook and stir over medium heat until thickened. Stir in Grand Marnier then cover and chill; makes ¾ cup. Learn how to make strawberry cheesecake with white chocolate strawberries. FOR STRAWBERRY FILLING combine all ingredients in heavy saucepan. Bring to a boil stirring constantly crushing berries with back of spoon. Stir and boil for 2 minutes to thicken (Will be slightly chunky). Pour mixture into bowl and cool completely. FOR CRUST PREHEAT OVEN to 350F degrees; position rack in lower third of oven. Place a baking sheet on oven rack; butter 9 inch spring form pan with 2 ½ inch sides. Blend cookies in processor until almost pasty. Through the feed tube add butter, water and vanilla while running. Process until mixture adheres to the sides of bowl. Press dough firmly into bottom and 1 ¾ inches up sides of pan. Refrigerate 15 minutes; bake about 10 minutes until golden brown. Place crust on rack and cool; REDUCE OVEN TEMPERATURE to 325F degrees. Pour melted chocolate into bottom of crust; spread with back of spoon and chill 10 minutes. FOR CHOCOLATE FILLING beat cream cheese in large bowl with mixer until smooth. Gradually and sugar to bowl beating until fluffy; add eggs and vanilla beating until smooth. 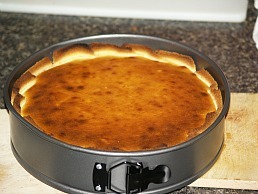 Spoon HALF of filling into crust; place cheesecake on baking sheet. Bake until filling is barely set about 35 minutes; cool 20 minutes. NOTE: Top looks dry and filling moves in one piece when shaken. 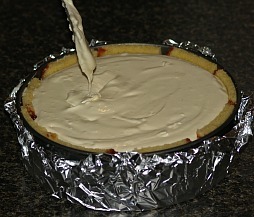 Gently spoon STRAWBERRY FILLING over the cheesecake filling (From outer edge to center). Gently spoon remaining HALF cheesecake filling on top of strawberry layer. Bake about 50 minutes (Sides are set and center moves slightly); cool 5 minutes. 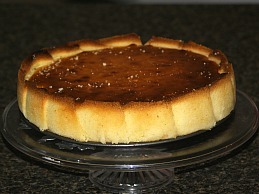 FOR TOPPING mix sour cream, sugar and vanilla; spoon over cake and bake 10 minutes. Run knife around edge of cake to loosen; refrigerate overnight. Spoon melted chocolate into pastry bag with small tip; pipe over top of cheesecake. Refrigerate to set chocolate piping. Remove sides of pan and place on plate; garnish with white chocolate dipped strawberries. Melt white chocolate in top of double boiler over hot water (NOT boiling). Stir white chocolate until smooth; set off heat. Hold strawberry by stem dipping halfway into the white chocolate (Tilt pan if necessary). Place berries on parchment paper; refrigerate about 30 minutes to set white chocolate. Spoon melted semi sweet chocolate into pastry bag with small tip. Pipe “zig zag” lines over the white chocolate on strawberries. Refrigerate until semi sweet chocolate firms up about 10 minutes.